I can’t really say I’ve ever really been a huge fan of the Madagascar animated series, but I usually saw the appeal, but one thing I wouldn’t really consider neccessary is a standalone movie centered on the Penguins. Same with the Minions in Despicable Me. They are cute characters meant solely for comedic relief, by making them the main attraction, you lose a little bit of your dignity…at least I would think so. 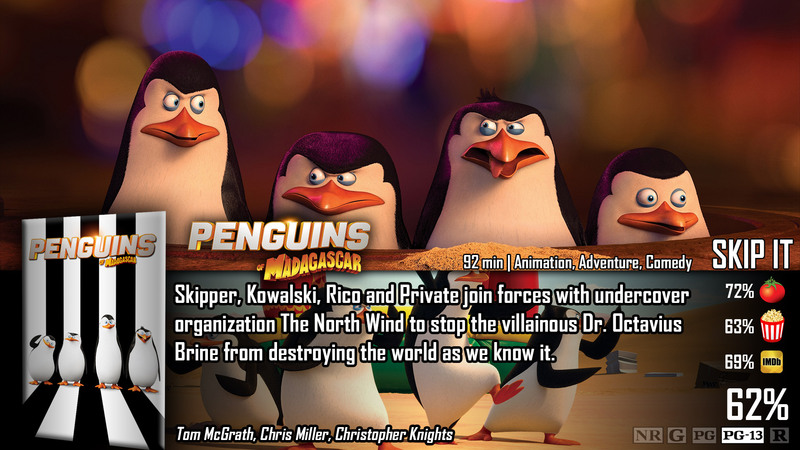 You see, if it weren’t bad enough, The Penguins of Madagascar already have a television cartoon series on Nickelodeon…why on earth did they need a movie? I’m not really sure, but let’s take a look at Penguins of Madagascar. You’ve seen the Madagascar films, right? Those are the ones with the escaped Zoo animals that go on ridiculous adventures and end up having ridiculous musical numbers. Anyways, among the animals are the Penguins of Madagascar, a group of four sarcastic and pun-heavy penguins that are always up to no good, self-serving purposes. It’s really no different here, except there is no inclusion of the famous characters from the other films. This is strictly PENGUINS ONLY territory…or is it? When penguins from all over the world are getting kidnapped, its up to our favorite penguins to save them from the evil octopus Dave. Before we get in too deep with how this is a standalone Penguins film, let’s not forget that in all honesty…it’s really not. This film introduced us to another group of animals that are more or less spies – which included Benedict Cumberbatch as the wolf in charge, and only real reason why I watched it. The more it moved along, the more I noticed how the Madagascar gang was simply traded in for these spy dudes…so I’m kind of confused why it’s technically called Penguins of Madagascar when the other players were just as important. That being said, the spies aren’t as memorable as the Zoo folk, so it felt more like a generic rip-off animated flick than it did a spin-off. I had a generally bad feeling in my gut before watching it. As I mentioned above, the Penguins were a comedic relief source for a reason, and they should have never been taken advantage of for the film corporation’s evil greedy pockets. They don’t work as their own thing. I’ve always believed that comedic relief character(s) are only effective in limited doses. Which means if you have too much of that, you overdose on silly puns to the point of exhaustion. Word to the wise, kids, too much of a good thing is a bad thing. There may have been good things about this film, and the concept of turning it into a spy thing was kind of fun as well, but you’re good after a half hour. The rest is just drags on…and on…and on. I was bored, plain and drain. It starts out okay, but the reason to continue watching it escapes you and you realize the rest of the movie is really just made for the kiddies, and the small ones at that. 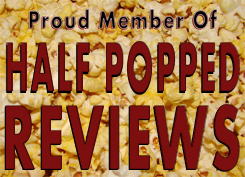 There is humor here and there that only adults will cue in on, which means that adults won’t be utterly annoyed taking their kids to the movies, but it really wasn’t enough of that either. My official recommendation is just to stick with the Nickelodeon show if you want to keep your kids distracted. To be honest, Penguins of Madagascar starts out on a good, no, a great note. There was a lot of action that never let up, and some pretty interesting choices in direction and some solid jokes that feel fresh and are smoothly presented. Everything that’s good about this movie is only in the first half hour, in my opinion. The jokes may be the same, as may be the action – but you can only take so much of it before you’re ready to move on. A good hour of this thing will have you tapping your feet out of a mixture of both annoyance and boredom.